"Left-Hook Lounge Mailbag": Chavez Jr. at 168, Cotto's Last Dance? & Khan's Pursuit of Mayweather!!! “Left-Hook Lounge Mailbag”: Chavez Jr. at 168, Cotto’s Last Dance? & Khan’s Pursuit of Mayweather!!! Marco G. (Miami Lakes, FL): I’m a Chavez Jr. fan, but I was totally disgusted with the outcome of the fight! I’m beyond entertaining the thought of what our sport can do to fix this criminal activity. But I would like to know how you think he will perform at 168lbs? Vivek W. (ESB): I think the pending move to 168lbs will demonstrate that it’s both a curse and a blessing, as all positive effects of this move will be nullified by the reality it brings. When we look at his past fights, Chavez Jr. has shown what some view to be a “very good chin”. But few stop to actually question whether or not this has anything to do with the fact that he’s taking shots from men who are naturally much smaller. Chavez Jr. has walked around every bit of 185-190 plus pounds. Every camp has required him to fight this battle before entering the ring to fight the one he signed to take on in the first place. Having to lose less weight in camp should help, but now he’s going to be taking shots from men his size. The operative question here, technically, is how well will he respond to punches by men who walk around closer to his actual ‘between-fight’ weight? Seems that every fight he takes has ended up with his eyes busted up, or face stitched up. That was considerably smaller men inflicting that damage. What happens at super middleweight? I’m not so sure! I wouldn’t go as far as to say that he will be a stepping stone for anyone; but I will say that I don’t like his chances, when we take a look at the super-middleweight landscape. When we look at the names atop the ledger in this division, I think most really leave him slim odds. Andre Ward? I think this would be an absolute massacre. He would be beaten to a bloody pulp, and it’s not beyond the realm of possibility that he could be stopped late. Ward would eat his body alive and force him to fight in the trenches of closer armed combat, which no one really has, to date. Carl Froch? Absolutely too slick, durable, and savvy to fall victim to Chavez Jr. Even the aging Mikkel Kessler could be too much for him at this stage. I just really don’t feel too strong about his chances in this weight class against the top level of competition. To be honest, when we look at his level of competition to this point, I didn’t totally like the list of opponents he already faced. The one true name on his resume beat him soundly, 11 rounds to 1! I think any credible name at 168 will probably come close to doing the same. To be quite frank, I’m not very big on Chavez Jr. As an athlete, I find his lack of discipline and credibility quite disgusting, to say the least. And when we look at the way Arum padded his record by feeding him cupcake after cupcake, it’s no coincidence why the truth often surfaces when he’s confronted with real competition. I think the Chavez Jr. legacy has been one of the most fraudulent we’ve seen in the sports history. And a decision like the one rendered last Saturday night is little more than a reminder of the man it supported. 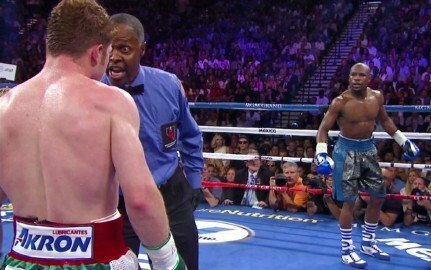 Two major blackeyes, in yet another sad moment in Boxing history. Henri N. (Lake Mary, FL): Miguel Cotto is my favorite fighter, but I’m afraid going into next Saturday’s fight against Delvin Rodriguez. How do you rate his chances? And what do you think is next for him if he wins, as well as if he loses? Vivek W. (ESB): Coming off two back to back losses and facing the proverbial “west-side” of his career, no doubt, this is a very important fight for Miguel Cotto. Potentially a career ending fight. The stakes are high and the level of depths he could hit in the case of a loss could be catastrophically low! Until the final bell rings, unfortunately, we just won’t know! Rodriguez is one of those fighters who could easily play the role of the “spoiler”. We’ve seen him lose to guys he should have soundly defeated; and we’ve seen him give guys you would expect to defeat him a run for their lives! I really think he could do enough damage in this battle to remind Cotto that nothing on this level comes easy. That being said, anything worth having is worth fighting for. And for Cotto, this is it! Every fight from here on out for Cotto has to be viewed as a fight for his life! I have no question that he will approach it with a strong will to be the last man standing. But is it really that simple? Aside from the mental battle within himself that tugs at his confidence, Cotto will also enter the ring with a new trainer! Veteran trainer Freddie Roach. A man who has also seen his stock in the sport fall rapidly in the wake of consecutive losses at the elite level. Cotto recently gave Roach the thumbs up by stating that he is learning to go back to those things he “abandoned” from his early career days. Roach recently stated that his new pupil has given him a different, more intense angle that benefits him as a trainer. Seems that both men are feeding off one another and using this momentum to carry them into Saturday nights showdown. I like the energy such an effort could produce. But when the rubber hits the road, I really don’t know how long that energy will sustain? If it carries them through Saturday night, will it really last through a potential Cinco de Mayo showdown with Canelo – which is the path most expect Team Cotto to charter next? At this stage, perhaps it’s all about living to die another day! But a gritty opponent like Rodriguez will undoubtedly test that theory to the limit. As a fan of the sport, I’ve set my mind to simply accept whatever becomes. It’s a fight Cotto should win. But the sport of Boxing often reminds us that there are no certainties. The man Cotto now aligns himself to face next (Canelo) knows that all too well, as three other times he set out to face men who always seemed to fall short to unlikely circumstances. James Kirkland? Incarcerated. Paul Williams? Injured, never to box again. Miguel Cotto? Lost to Trout. Now here we stand yet again, ready for “take 2” between the two. How does it all play out, this time? Stay tuned to find out. Barry I. (Chicago, IL): Rumor has it that Khan has stepped away from the negotiating table with Devon Alexander so that he can take the Mayweather clash and allow Alexander to face Judah. Is there any truth to this rumor? Vivek W. (ESB): There’s been a ton of back and forth on this front, but nothing quite confirmed. From what I’m being told, much of this discussion is all premature. One source I contacted about the matter said something to me that stuck. Her position was made quite strong, as she said “be careful who you choose to listen too, because desperate beneficiaries are known to plant seeds, hoping to establish a heartbeat in the media from inquiring minds just like yours”! She went on to say that this fight could happen. Yet in the end, she cautioned that at this stage, there’s “more speculation than conversation”. When we look at what Mayweather just accomplished and the type of dancing partner it took to get him there, without doubt, Khan is a step down. He’s a young gun with great potential, but he’s been that from day one. Somehow, it’s a reputation he continues to fumble before he can find a way to make the big score! Perhaps that’s where the logic of him stepping aside and not facing Alexander comes from, and it would make perfect sense. My problem with that logic is that Mayweather would go from facing the most dangerous fighter below 160lbs, to facing an unaccomplished competitor who would have effectively backed his way into a showdown against the best fighter in the sport. There’s a lot of tickets to be sold at the U.K.’s Wembley Stadium, but there’s a few more to be made against a more credible and familiar name. Quite to my surprise, it was conveyed to me that there is in fact a wildcard shot that Pacquiao could get the nod if he looks good in a victory against Rios in November and “brings the right attitude to the negotiations table”. Besides, a Cinco de Mayo fight in the U.K.’s Wembley Stadium won’t exactly be an easy sell; unless it’s a split site feed with Canelo/Cotto taking place here in the U.S. on the undercard, of course! That being said, I could see Mayweather entertaining the idea for a Fall, September 2014 time frame showdown with Khan if he stays in the winners circle! Either way, it’s all up in the air this early out. What I can say is that Danny Garcia, Amir Khan, and to a far lesser yet slightly active degree, Manny Pacquiao, are the names who will round out the top three hopefuls. Quite a few things can happen between now and then. Lets see if anyone else emerges. (Vivek “Vito” Wallace can be reached every Tuesday night on “Left-Hook Lounge Radio” from 9ET – 11ET. He can also be on Twitter (@vivekwallace747), Instagram (ViveksView), and Facebook). You are here: Home / Boxing News / “Left-Hook Lounge Mailbag”: Chavez Jr. at 168, Cotto’s Last Dance? & Khan’s Pursuit of Mayweather!! !